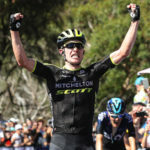 Colombian Esteban Chaves (Mitchelton-SCOTT) has sensationally ridden into the Jayco Herald Sun Tour lead after a stunning solo victory atop Lake Mountain on the Mitchelton Winery Stage 3 of Australia’s oldest stage race. In his first stage-race back since a season-ending crash at the Giro dell’Emilia in Italy last September, Chaves attacked at the base of the final ascent and rode clear of a quickly reducing peloton. 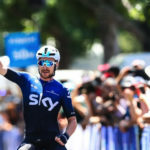 He powered up the category 1 climb with 20 kilometres remaining for a thrilling finale to the unrelenting 218 kilometre race that began in Nagambie at Mitchelton Winery. Twenty-one-year-old Alex Evans (Mobius BridgeLane) put in a breakthrough ride to finish second, riding solo up the climb in pursuit of Chaves and eventually finishing 42seconds in arrears. “I’m pretty pleased with that,” said the Bendigo local. “I had the team lead me 2 kilometres up the climb and then when they peeled off, Esteban peeled off the road so I tried to bridge across to him and no one else came with me, and I just couldn’t quite bridge across to Esteban. Portuguese National Champion Ruben Guerreiro (Trek-Segefredo) out-foxed his chase group companions to finish in third place, 1:09 behind Chaves. Mitchelton-Scott now hold the top three spots overall, with Chaves 32 seconds ahead of 2015 Tour winner Cameron Meyer and 39 seconds to reigning champion Damien Howson. 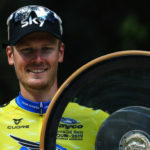 “We need to enjoy this – bike races aren’t easy. To finish tomorrow will be a hard one – everyone will attack for sure – and we need to finish it off,” remarked Esteban. On a day where riders were in the saddle for over six hours, the race began in the rolling hills of Strathbogie Shire. It headed up and into the picturesque town of Eildon, crossing over to Marysville before eventually finishing at the summit of Lake Mountain. An eight rider breakaway established at the 25 kilometre mark, including Gatorade sprint leader Steele von Hoff (Bennelong SwissWellness), Dutchman Etienne van Empel (Roompot-Nederlandse). Edmund Bradbury (JLT Condor), Brad Evans (Mobius Bridgelane), Jonathan Noble (Brisbane Continental), Mathew Ross (KordaMentha Australian National Team) and the McDonalds Downunder duo of Alexander Ray and Kane Richards. The group gained a significant advantage of six-and-a-half minutes before hovering around four minutes for the day. 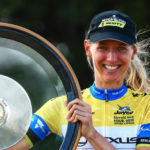 After an epic 185 kilometres baking in the summer’s heat, their time in the limelight came to an end, with the Mitchelton-Scott led peloton initiating the catch inside the final 25 kilometres. Chaves then lit up the race to end the queen stage in the yellow jersey. The 65th Jayco Herald Sun Tour concludes on Sunday with the Gumbuya World Stage 4 road race around Kinglake.